Mergers of equals may become a more significant trend in banking, and U.S. Bancorp and PNC could overcome their M&A reluctance to create a powerful national franchise. U.S. Bancorp and PNC have complimentary assets and platforms across commercial and retail lending, as well as fee-generating businesses. Both U.S. Bancorp and PNC are fairly attractive on a long-term standalone basis, and a possible deal is merely a "sweetener" to otherwise good standalone stories. Speculating on M&A is a tried and true way of passing the time between major news releases, and it’s overwhelmingly just a theoretical exercise, as the number of potential deals always dwarfs the number of deals done. That said, a recent turn toward mergers of equals in the banking space, including the large proposed tie-up of BB&T (BBT) and SunTrust (STI), adds a new element to the story. Although I don’t think you can count it as any sort of “base case”, and both banks have expressed their disinterest in large-scale whole bank transactions, I believe a merger of equals (or near-equals) between U.S. Bancorp (USB) and PNC Financial (PNC) could not only be very interesting from an EPS and TBV accretion point of view, but also from the perspective of creating a truly national bank with strong positions in commercial and retail lending, payments, wealth management, and other fee-generating businesses. I want to emphasize again that I’m not expecting such a transaction, and I do not recommending buying either U.S. Bancorp or PNC on the basis of M&A potential. Still, these are two high-quality banks traded below my estimates of fair value as is, and a transaction could create value for both shareholder groups. Neither U.S. Bancorp nor PNC need large-scale M&A to grow their businesses. Both banks already have large operating footprints with strong core deposit market shares in key markets. Both banks are also getting underway with organic growth plans on their own. For PNC, organic growth is being driven by selective market-driven commercial banking expansion. PNC entered Denver, Nashville, and Houston in 2018 and plans to expand into Boston and Phoenix in 2019. At the same time, the bank is launching a national digital bank on a relatively limited/focused basis (focusing first on Kansas City and Dallas), with a plan to follow up with a “thin branch” network of physical locations. For its part, U.S. Bancorp is also looking toward organic growth, with a similar thin branch (or “branch-lite”) strategy focusing on Texas, Florida, North Carolina, and Georgia. U.S. Bancorp is also looking to take advantage of its past investments in mobile/digital banking, and in the case of USB, that effort is helped by a large existing presence in cards, auto, and mortgage loans. With both of these banks already doing well on their own, and generally considered among the best-run banks in the country, why consider a merger? For starters, a combination would create a truly national bank. Although PNC has been expanding its commercial lending business into select markets, the branch network is east of the Mississippi, while U.S. Bancorp’s operations extend from California through Ohio (with a couple of branches in Florida). Although this combination would do little for either bank in terms of the attractive Texas market, PNC would add attractive exposure to Florida, as well as Georgia, North Carolina, and Maryland. While less attractive from a growth perspective, PNC would also bring profitable exposure and strong share in markets like Pennsylvania and New Jersey. 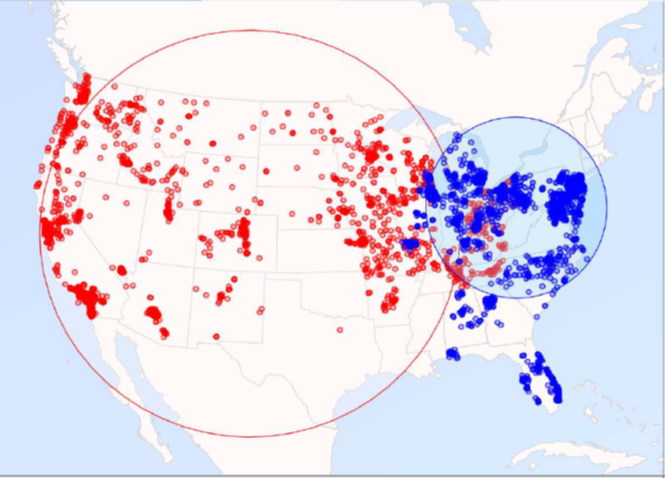 About 17% of PNC’s branches are within two miles of a U.S. Bancorp branch, overwhelmingly in Ohio, and while that could create some anti-trust concerns (the two would have about 25% deposit share), it also creates branch consolidation leverage. I believe the two businesses also bring a lot of complimentary parts. U.S. Bancorp has built itself into a strong commercial lender (#4 in C&I and #4 in CRE), but PNC would enhance that further with a strong presence in middle-market lending (it is the #2 syndicator of middle-market loans) and asset-backed lending (where it is #2 behind Wells Fargo (WFC) ), as well as specialty verticals. That, in turn, would give U.S. Bancorp an opportunity to cross-sell more of its lucrative services (payments, treasury mgmt, etc.) to this customer base. On the retail side, PNC’s focus on commercial banking has led to a lower share in residential/retail lending relative to what it’s deposit share would otherwise suggest, and U.S. Bancorp has a strong retail lending franchise that could profitably grow in those PNC markets. U.S. Bancorp also has a strong card business, which has been an area of historical weakness for PNC. PNC, through its large stake in BlackRock (BLK), would also enhance U.S. Bancorp’s wealth management operations – one of the relatively few areas where U.S. Bancorp hasn’t been so successful over the years (though it is a large player in trust). I believe that U.S. Bancorp could pay a roughly 20% premium to PNC’s current price (and a roughly 10% premium to my average fair value estimate) and still generate appealing value from a deal. I assume an all-stock deal and 30% cost savings (due to the branch overlap), and modest loan marks and still arrive at double-digit (low-to-mid teens) EPS accretion for U.S. Bancorp and TBV accretion from day one. The purchase price would also work out to a roughly 13% core deposit premium and a post-deal Tier 1 capital ratio of over 9.25%. It’s well worth mentioning again that both banks have recently talked down their interest in whole bank M&A, with PNC having consistently said for years now that they believe that the value of whole-bank transactions is no longer what it used to be. Still, I believe we are likely to see more and more consolidation in the banking sector, and I believe the geographical and operational/business synergies are special enough that both managements could conceivably get past their reservations about banking M&A in general. Relative to deals like BB&T-SunTrust and Chemical Financial (CHFC) – TCF (TCF), I don’t see quite the same need driving a potential deal. While U.S. Bancorp and PNC are both quite a bit smaller than JPMorgan (JPM), Bank of America (BAC), and Wells Fargo (WFC) (together USB and PNC would still be less than half the size of Wells Fargo and almost one-third the size of JPMorgan in terms of total assets), I believe they’re probably large enough that they won’t get left behind in the IT investments/development that will likely drive service and operational differentiation in the future. Still, I believe there are advantages to scale and as fintech-driven investments shake up the banking world, the larger players are likely to fare better. I believe a merger of equals between U.S. Bancorp and PNC would be a “sweetener” to what are otherwise still healthy standalone stories and undervalued shares. There are cheaper names out there in bank stocks (particularly in smaller banks), and this isn’t the optimal point in the banking cycle, but I think both stocks are worth considering, and a merger would be a rare once-in-a-career value-creation opportunity for two exceptionally well run and complementary bank franchises. Disclosure: I am/we are long BBT, JPM. I wrote this article myself, and it expresses my own opinions. I am not receiving compensation for it (other than from Seeking Alpha). I have no business relationship with any company whose stock is mentioned in this article.